Several members of the US Congress are very close to the Communist Party USA, most are also members of the Congressional Progressive Caucus. Some of the most prominent include reps , Dennis Kucinich , John Conyers and Barbara Lee. 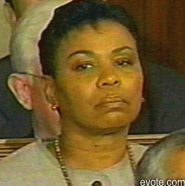 Barbara Lee is particularly blatant, in the early '90s even serving on the executive of a CPUSA breakaway group, the Committees of Correspondence. Lee has clearly kissed and made up with the CPUSA since then. Her activities are regularly covered in the CPUSA's Peoples Weekly World and Political Affairs. A highlight of the Northern California banquet in Oakland was hearing former Daily Worker sports editor Lester Rodney, now an energetic 95. He told the multigenerational, multiracial audience about the years-long struggle to integrate Major League Baseball, leading up to Jackie Robinson’s first appearance with the Brooklyn Dodgers in April 1947. “Jackie Robinson changed baseball, and when you’ve changed baseball in this country, you’ve changed this country!” said Rodney. Barbera Lee at a Communist convention? I am not surprised about this.